Soon “living walls” will be a common sight in many public areas. But for the time being, the University of Ottawa has the tallest in Canada. The interior space looks like any new building might look: painted concrete walls, contrasting stainless steel strips, tinted glass, soft lighting. Except there is a strange montage of tropical plants covering one wall from floor to ceiling, like some crazed, rapid-growth experiment, or a strip torn from the lush Amazon rainforest. 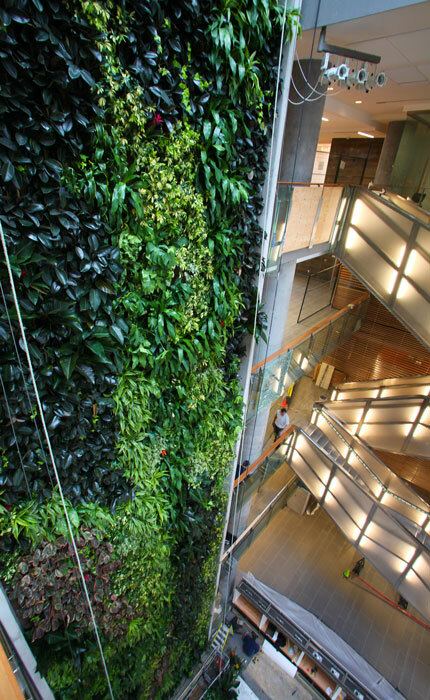 It is, in fact, a living, breathing wall—and it’s right inside the University of Ottawa’s new Faculty of Social Sciences building. Barely more than a curiosity at the October unveiling of this new facility, the wall deserves a much closer look. The brainchild of Dr. Alan Darlington, it is a breakthrough in clean air management—and its creation is linked to space research. The result was celebrated by both the Canadian and European space agencies before Darlington, a Canadian researcher, commercialized the wall under a company that merged with Ontario’s roof specialist, Nedlaw. “Unlike other green walls that exist, this one is actually a biofilter that cleans 80 to 85 per cent of the volatile organic compounds in the air in a single pass,” says Nedlaw maintenance manager Ashley DeMarte. 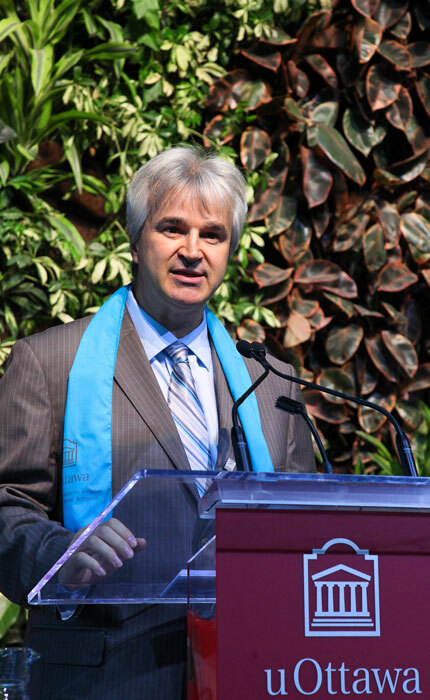 DeMarte designed and helped build the uOttawa Living Wall. At 78 feet, it is the tallest in Canada. Conventional ways of controlling air quality in a building involve sending old air out and bringing fresh air in through a ventilation system. The problem is that you can’t do this without losing heat in winter or coldness in summer—and if the building is next to a highway or in an industrial zone the outside air quality is questionable. Dr. Darlington knew that plants do an excellent job of naturally purifying the air we breathe, but it was evident a few poinsettias at Christmas wouldn’t do the trick. He and his team had to think big—and they did. “The living wall is part of the air circulation loop. Air is forced through it and fed back in the circuit,” explains DeMarte. Nedlaw’s Biofilter Living Wall reduces the amount of air intake and lowers heating and cooling costs. The unit can even render the humidifier unnecessary—a substantial savings for property managers or owners. Oh, and forget about allergies, too. The wall lowers concentrations of dust, fungal spores, and airborne bacteria. It is also why the wall rarely incorporates flowers; they tend to carry more allergenic matter, “and they can be messy when they wither and die,” says DeMarte with a smile. Speaking of picking up the petals, a living wall has to be cared for like any garden or other plants. Once a month, Nedlaw’s best will trim and groom the greens, which are rooted in sheets of substrate with water running behind. “It definitely is more than just a fad,” says DeMarte about the more than one hundred living walls across Canada and in the United States. Students and staff at the University of Ottawa are more than aware of the institution’s efforts toward protecting the environment: the green roof section atop the Colonel By exit, the clever use of tunnels to circulate heat between buildings, the harnessing of heat from computer servers, the use of waterless urinals, and the recycling of furniture are all part of a constant effort to save energy and resources. The University’s commitment to being a green-friendly place is enough to make other universities, well … green with envy! Researchers and students of the Faculty of Social Sciences (FSS) are now together under one roof. The new 15-storey building accommodates 10,000 students, 260 professors and 100 staff members in state-of-the-art facilities. The entire second floor was designed expressly for students, providing them with numerous study areas and places to gather and thus offering a rich and inspiring student experience. Each floor boasts meeting rooms, making it easy for researchers and students to get together to work on projects. But the new building is far more than just a spectacular architectural jewel. It meets strict environmental guidelines, which reflect the Faculty’s values and the University’s formal commitment to sustainable development. 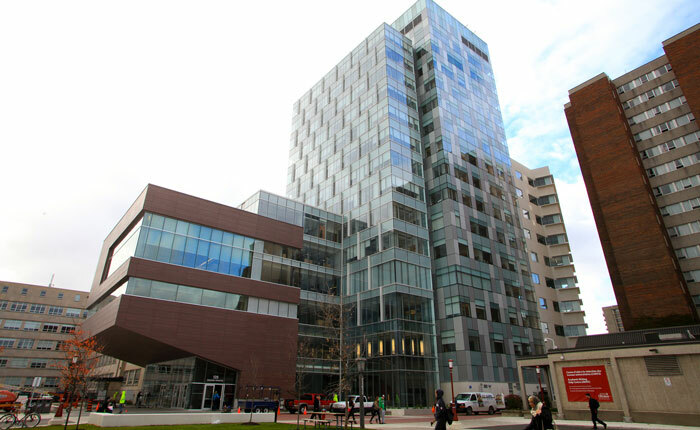 The administration is seeking a LEED Gold certification for the building, that brings the FSS’s new home close to being a net-zero energy building in terms of greenhouse gas emissions and heating load.. Construction for the building started in August 2009 and it was inaugurated in October 2012.